The art production company, Artangel, has set up an exhibition in Reading Prison, to run from 4 September to 30 October. It features well-known artists such as Steve McQueen (director of “Twelve Years a Slave,” Felix Gonzalez-Torres, Nan Goldin, and Turner Prize winner Wolfgang Tillmans. 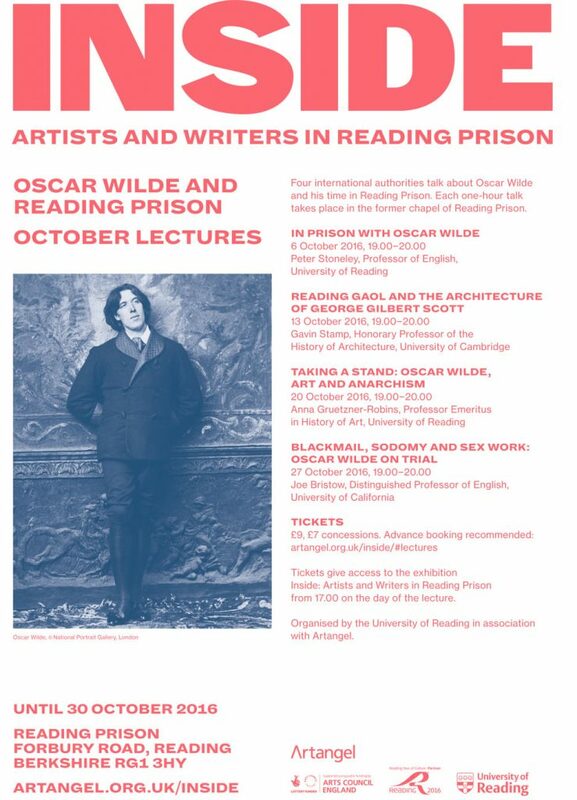 Artangel asked me to give a lecture on Oscar Wilde’s time in Reading Prison, and to help them with organising a short series of lectures to run during the exhibition. All the lectures to be held in the former prison chapel. See the flyer below for details. This entry was posted in Department of English Literature news and events and tagged Artangel, Department of English, Department of English Literature, English Department, English Literature, Oscar Wilde, Professor Peter Stoneley, Reading, University of Reading. Bookmark the permalink.